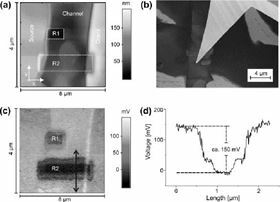 We report on the influence of Focused Ion Beam (FIB) exposure on TIPS-pentacene layers which are often used in solution-processable organic field-effect transistors (OFETs) and in many cases yield a field-effect mobility in the order of 1 cm2/V s. We exposed TIPS-pentacene layers to a Ga+ ion beam and measured the device characteristics of OFETs. We observed a strong influence of the FIB on J–V characteristics of TIPS-pentacene-based devices and determined an increase in the OFET mobility and on–off ratio and a decrease of the threshold voltage. To further investigate the underlying process we analyzed FIB-exposed and unexposed TIPS-pentacene samples via X-ray Photoelectron Spectroscopy (XPS). Exposed samples show a clear Ga XPS signature and the C1s peak shifts about 400 meV towards smaller binding energies which is an indicator for a Fermi energy shift closer to the valence states and hence p-doping of TIPS-pentacene. With Scanning Kelvin Probe Microscopy (SKPM) we could clearly distinguish FIB exposed areas from the unexposed areas. For exposed areas the work function increases about 200 meV which is consistent with XPS measurements and again displays that the implanted Ga+ ions serve as p-dopants. Furthermore we took SKPM measurements on operating OFETs and could investigate a dramatic change in local conductance on FIB exposed areas. This demonstrates a novel way of nanopatterning conductive paths in organic semiconductors. This paper was originally published in Organic Electronics 14 (2015) Pages 1570–1576.